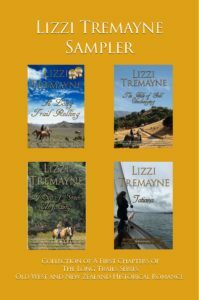 Author Lizzi Tremayne brings you this first chapter sample collection of her historical fiction series: The Long Trails. You can start reading her debut novel, A Long Trail Rolling, to begin the series. Follow Aleksandra and Xavier as they cross countries and seas from the wilds of 1860’s Utah to the farthest reaches of Colonial New Zealand as you continue on with The Long Trails series. Bring along some pemmican, you’ll be sure to need it! 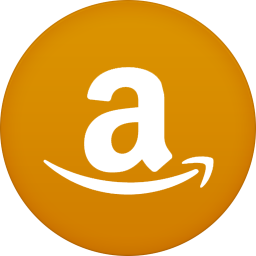 This sampler is free when you join Lizzi’s VIP Club! Click here for your free copy! 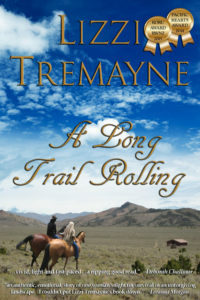 Author Lizzi Tremayne brings you the first installment in The Long Trails series, A Long Trail Rolling. Aleksandra, trained by her father in the Cossack arts, finds herself alone in 1860 Utah. Disguised as a Pony Express rider, she’s running to keep her pa’s killer from finding their family’s secret–and that was before she galloped full speed into the middle of the Paiute Indian War. Xavier isn’t about to let anyone get too close, especially a woman, while he bides his time as a Pony Express Station Manager in the middle of a desert, evading his heritage as the eldest son of an old Spanish Californio family. Letting this slip of a stroppy, yet alluring, girl get under his skin is not on the cards. The villain is coming closer, with his sights set on Aleksandra. Thrown together in an ever-worsening situation, can Aleksandra and Xavier overcome their differences before the ever-increasing odds overtake them? Don’t miss out on Lizzi Tremayne’s other stories, The Long Trails series: The Hills of Gold Unchanging (Book Two), A Sea of Green Unfolding (Book Three) and coming soon: Tatiana (Book Four) and Once Upon a Vet School series: Once Upon a Vet School #7: Lena Takes a Foal! A Long Trail Rolling is available in eBook plus standard and large print paperbacks. As the Civil War rages, secessionists menace California. Aleksandra and Xavier are trying to get back home—through the oncoming Civil War, the mining camps of 1860’s Nevada and California, and the Sacramento floods—to Xavier’s Californio Rancho de las Pulgas. Embroiled in the Confederate’s fight to drag the new state from the Union and make it their own, can Aleks and Xavier survive? 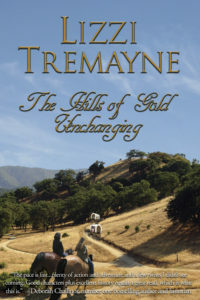 The Hills of Gold Unchanging is available in eBook and standard and large print paperback. Tragedy strikes in Aleksandra and Xavier’s newly-found paradise on their Californio Rancho de las Pulgas and newspaperman Gustavus von Tempsky invites them on a journey to a new life in New Zealand—where everyone lives together in peace. Unfortunately, change is in the wind. When they reach Aotearoa, they disembark into a turbulent wilderness—where the wars between the European settlers and the local Māori have only just begun—and von Tempsky is leading the colonial troops into the bush. 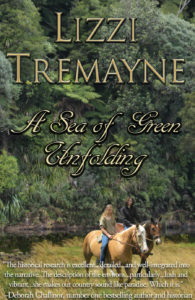 A Sea of Green Unfolding is available in eBook and paperback. Horses bring them together and their future looks rosy—it’s the present they can’t handle. When equine veterinary student Lena and veteran pilot Blake fall in love, vet school and the past intrude. Add in a long-distance relationship, and things get just plain hard. A grueling endurance race forces them to draw on their strengths and face their fears—together. 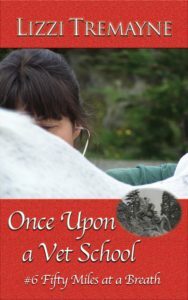 Once Upon a Vet School #6 is available in eBook and paperback. Lena Scott has a problem—one that might prevent her from graduating from veterinary school. After a messy divorce, Kit Allen returns to his first loves—horses and his old veterinary school alma mater. He excels at imparting his knowledge to students and is determined to earn a tenure track position. Becoming involved with anything but a pager—ever—isn’t in the cards. Especially a talented and beautiful student in need of his assistance. When Lena’s horse rears over backwards and lands on her, it has to be the dashing resident, Kit, who finds her. Luckily for her, she’s sworn off relationships after her last romantic disaster. She has more important things to worry about than sea-green eyes and rugged good looks. like oil and water, they just don’t mix. Once Upon a Vet School #7 is available in eBook and paperback. A new country, a great job, and a “good Kiwi bloke”. Newly emigrated to New Zealand, equine veterinarian Lena wants a “good Kiwi bloke”, but they’re elusive as their nocturnal namesake. Her history with men is not, shall we say, salubrious. Nigel’s avoiding females, unless they’re cows, horses, or his mother. After his first marriage, he won’t be responsible for anyone else’s life ever again. Sparks fly when they meet, but not that first time, over the dirty instruments in a filthy cowshed. They’re made for each other… until Nigel remembers where he first saw her. And then the questions start. 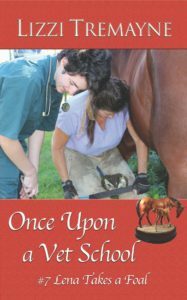 Once Upon a Vet School #10 is available in eBook and paperback. You can sign up for Lizzi’s VIP Club and get her free sampler here! IT’S NEVER TOO LATE FOR LOVE! Want to keep up with the Belles? Here’s our sign-up form.